Berlin [Germany], Nov. 21 : German Chancellor Angela Merkel has announced that she will run for a fourth term as chancellor in the next year's crucial national election. Asserting the complex challenges she will face and "absurd" expectations Germany could take a world leadership role when Barack Obama leaves office, Merkel insisted that the decision was not easy for her to make. "I have spent an unending amount of time contemplating this, as to stand as a candidate for a fourth time after 11 years in power is anything other than a trivial decision, neither for the country, for the party, nor for me," the Guardian quoted Merkel as saying in a press conference in Berlin on Sunday night. On Sunday, Germany, the European Union and the US have encouraged their fellow G7 members to form such climate change polices that set a global example. On Monday, the G7 leaders will again discuss the issue. On the other hand, Chancellor Angela Merkel has been facing resistance from Canada as the latter does not want that the group should push the agenda on its own. Also, Japan does not want to end its role from use and support of coal both at home and abroad. In Saturday's video, Merkel said that December's Paris climate change conference would be able to be successful only when the G7 members will be committed to curb the rise in global temperatures to two degrees Celsius. Beijing, March 10 - Chinese President Xi Jinping and German Chancellor Angela Merkel Sunday discussed their bilateral relations and the Ukraine crisis over phone. Xi said that as the current situation in Ukraine is very complicated and highly sensitive, various factors should be taken into consideration in the handling of the crisis, Xinhua reported. He called on all parties concerned to exercise restraint and seek a political solution through dialogue and negotiations within the framework of law and order, so as to avoid further escalation of the situation. Berlin, April 11 : India and Germany Thursday held the second inter-governmental talks to explore possible areas of cooperation. Prime Minister Manmohan Singh is co-chairing the delegation level talks along with German Chancellor Angela Merkel. External Affairs Minister Salman Khurshid, Commerce Minister Anand Sharma, Renewable Energy Minister Farooq Abdullah, Human Resource Development Minister M. M. Pallam Raju and Science and Technology Minister S. Jaipal Reddy are taking part from the Indian side. Seven German ministers are assisting Merkel at the talks. The Indian Information Technology firms are bracing themselves for a difficult year ahead due to the ongoing debt crisis in the European countries as well as policies in the US states that discourages outsourcing by firms. Europe is the biggest market for the Indian software firms after the US. Service orders from the region are expected to be low in the coming quarters due to the prolonged debt crisis in the Euro zone countries. The European leaders have come together in times of Europe's worst financial crisis in generations while the UK has been pusher to a corner. 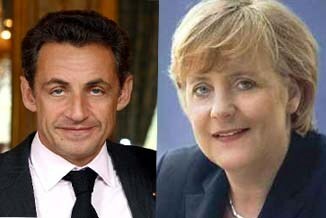 German Chancellor Angela Merkel and French President Nicolas Sarkozy succeeded in persuading all the members of the union except the UK to endorse a new agreement involving tighter fiscal rules. Leaders of the member states of the European Union have agreed on much tougher rules government their budgets in order to control the economic crisis in the region. Following hours is discussions among the leaders; they agreed to work towards a new "fiscal compact". The member states will now work under tougher deficit and debt regime in the eurozone amid growing threats from the debt crisis. The Euro rose slightly against the dollar after following hints that the proposal to channel European Central Bank loans through the International Monetary Fund could bring in 200 billion euros for resolving the debt crisis in the Eurozone. The new government in Italy has put forward to cut its deficit before a European summit to help resolve the debt crisis. The euro rose 0.1 percent to $1.3404 from $1.3391 on Dec. 2, when it had recorded a growth of 1.2 percent n the week. In her meeting with Greek Prime Minister George Papandreou, German Chancellor Angela Merkel lauded the austerity efforts of the former and shifted the focus saying Greece doesn't need financial aid. Merkel instead expressed her desire to restrict the use of derivatives that exploit a nation's budget deficits, in this case Greece. According to the German Chancellor Merkel, she, along with other leaders from European Union, will make sure that the Greek debt crisis doesn't come into the way to stability for the euro, not even in the coming future. After the discussions with the Greek Prime Minister George Papandreou, the German chancellor paved the way to comprehend the discussion on Athens to initiate the reforms process, as soon as possible. However, nations like Ireland have already been to the rough and bumpy roads along with Germany on its side trailing a little late. Further austerity measures unveiled by Greece have won the confidence of its EU counterparts, but any sort of financial assistance is still a 'mirage' for the Debt-stricken country. German Chancellor Angela Merkel will meet the George Papandreou tomorrow, but made it clear that that the talks will focus on Greece's fiscal prudence and certainly not about any aid commitments. Wolfgang Schaeuble, German Finance minister, however was hopeful that the recent deficit-reduction measures proposed by the Greek Prime minister were sufficient to persuade investors to buy Greek bonds. The measures are "convincing," the European Central Bank said.